It takes people who are truly special to work with individuals with special needs. Many members of our staff do an exemplary job, going “above and beyond” what is in their job description to improve the lives of the adults and children in our many programs and to make The Arc better and better. No matter what disability services they are doing, they stand out from the crowd. They’re always a cut above. These are our ARC STARS, and we want everyone to know how special they are. If you know any ARC STARS, be sure to tell us about them so we can recognize them for their part in helping adults and children with disabilities and let everyone else know as well. 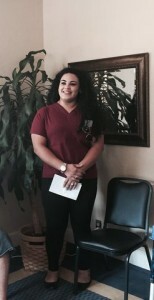 Congrats to our newest Arc Star, Theresa Jiminez. Theresa has been with The Arc for three years now and works at our our Deacon Road Day Program. She’s wonderful with the men and women at Deacon, whom she considers part of her family. Her other outside-of-work family, though, includes not only the usual family members we all have but also a menagerie of the two and four-legged variety as well: five cats, two dogs, several inhabitants of her chicken coop, and Hawkeye, her Rhode Island Red rooster, who often accompanies her on car rides! Theresa sees to it that Deacon is cleaned at the end of each day, cleaning that includes buffing the floors every week. It’s a fun job because she gets to use that nifty little mini-Zamboni floor cleaning machine. Maybe that’s why she always has a great attitude and smile. Theresa is a great staff person, the official Deacon Road holiday decorator, and a wonderful advocate for everyone she works with. Great job, Theresa. Keila was hired as a sub back in April of 2017 but was quick to become a fulltime employee by the next month, May. She’s been at Grayson Group Home ever since. According to her manager, Keila is exceptionally professional and dedicated to the job and the five ladies who live there. It’s obvious to everyone that she is loved by the ladies and her co-workers, and they like working with her. She has mastered our various computer programs, especially Therap, and is always punctual making medical appointments and seeing that the ladies get to them on time. It takes a lot of juggling, but she manages to make it look easy. Keep up the great work, Keila. 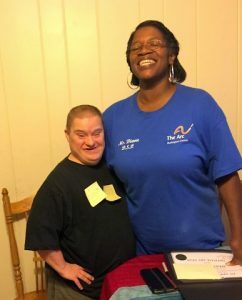 For someone who didn’t start out in the human services field, Kim Avale has certainly made it her own during the 4-plus years she’s been with The Arc. Kim’s background was in the hospitality field and while that might not seem compatible with what she does today, there are really a lot of similarities: one must be a people person, be concerned with the welfare of others, be able to solve problems sometimes with only a moment’s notice, be willing and able to take on added responsibilities (not always listed in the job description) and be dedicated to coping with the issues each day brings. Kim has proved that she’s up to all those tasks and as time goes by is only getting better and better at everything she does. 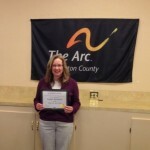 Kim started with The Arc back in March of 2014 as manager of our Marne Highway Group Home. 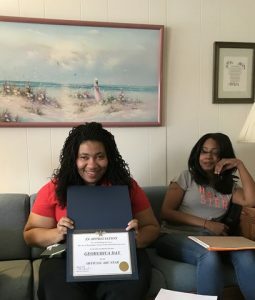 By June of 2016, she showed she was ready to take on another important job, that of residential coordinator overseeing several programs instead of just the one. 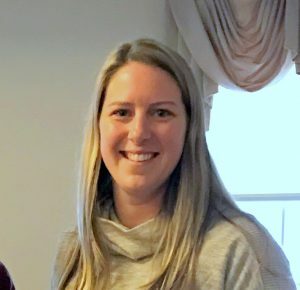 Today Kim’s in charge of Marne Highway, Eayrestown, Columbus and Chestnut Hill residential programs and Moorestown supervised apartments and has things running smoothly. Of course, there are always quirks and surprises that arise from time to time — some days more than others — but she’s learned to handle them with the skills she’s honed not only during her tenure with The Arc but also her training in the hospitality field. So far, both fields seem to have meshed perfectly. Nice job, Kim; keep up the great work. Georgrica Day has been a wonderful asset to the running of our Moorestown Supervised Apartments and to the ladies in the program. Even though she’s been with The Arc only since August of last year, her familiarity with routines, her skills, and her willingness to help out wherever help is needed make it seem as if she’s been here a lot longer! Grica, as she likes to be called, has such a positive attitude that it’s catching and most evident when she and co-workers team up on projects. Everyone benefits, especially the ladies. She’s even been known to take time on her days off to clip store coupons to help make the food budget stretch even further. She’s always willing to cover hours to keep the program running smoothly and has been known to actually walk to work when car problems would have made her late. That’s dedication— and another reason why Grica is a perfect candidate to be our latest Arc Star. So far we haven’t found much that Jeff Tinnick can’t do. He’s our maintenance supervisor and jack-of-all-trades. He can fix a toilet, patch a wall, dig up a floor, find a leak, replace a window, re-tile a swimming pool, put together whatever needs to be assembled, fish a wire through the ceiling to wherever it needs to go, even build an entire office from scratch! He’s done all that and keeps coming up with new things to amaze us. He knows everyone in all the group homes and day programs and is always willing to pitch in whenever there’s a problem — or whenever he diagnoses there will be a problem. Jeff is reactive to immediate needs and proactive for those about to happen. It’s truly uncanny. The Learn-A-Way program is especially grateful for his help (although other programs would argue that he’s been just as helpful to them). He saved them lots of money last summer by fixing pool cracks before they became unmanageable, re-tiling the sides, and getting the area ready for our campers — often in 90 to 100 degree weather when it would have been much nicer inside in air conditioning. Along with helpers from the lawn crew, Jeff also oversaw removal of the pool cover — a massive job — and getting out and cleaning all the patio and pool furniture stored over the winter. It‘s hard to imagine what The Arc would do without Jeff, so we won’t even try. Thanks for all those many, many jobs so well done. And congratulations. Virginia has been a mainstay at our Marne Highway Group Home for many years and helps keep daily routines fun and cheerful. Her goal, it seems, is to make sure each lady has a smile on her face and a good laugh before leaving for workshops or appointments. She shows a constant willingness to help out even when it isn’t her specific duty, and it’s evident by everything she does that her focus is on helping the ladies do fun things and be the best they can no matter what, whether it’s giving impromptu manicures, painstakingly untangling a knotted necklace chain or holding someone’s hand at a doctor’s appointment. Virginia has been a huge help to the program director/residential coordinator throughout her stay at Marne and has made it very clear she wants to be kept busy all the time, so she’s pretty much always moving! Whatever task she does is always done well and completely, and she is truly a valued employee for The Arc and especially all the lucky ladies and staff at Marne Highway. Diana West is someone who makes you smile just by being in her presence. She recently took a week off for vacation and things just weren’t the same: every day someone or other asked where she was and when she was coming back; and when she did came back, WOW! Every face at Eayrestown broke out in a big grin! She’s very generous and thoughtful and has been known to bring little gifts for each of the guys, things she bought at the dollar store or Five Below. And even though they weren’t expensive or high tech, it’s evident how much she cares and how much everyone loved what she gave them. Did we mention that she’s quite a cook as well? She catered the entire Labor Day menu for the Eayrestown annual holiday picnic, and what she cooks during second shift makes the house smell great and keeps mealtimes something everyone looks forward to. It’s evident Diana has a heart of gold, and we’re happy she shares her abilities and kindness with The Arc of Burlington County. We’re all richer for her being here, but the men of Eayrestown are especially lucky to have her all to themselves. Congratulations and thanks, Diana. 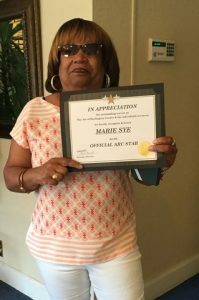 Marie Sye has been part of The Arc of Burlington County “family” for about 28 years now, give or take a few breaks in her longevity. She started as a sub in 1988, left us for a while, but then came back again because we’re hard to forget! In 1999 Marie became part-time at Whitehall Apartments, subbed again, then went full time at Crestview Apartments in the morning shift where she’s been since 2012. 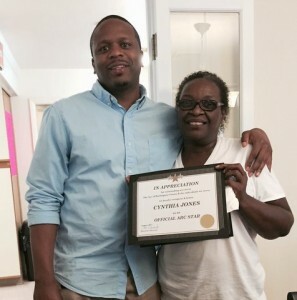 Marie was recently a great help to Residential Coordinator Will Mouzon during a leave of absence by the program manager. According to Will, Marie was — without fail— at least 15 minutes early each day so she could read up on the previous night’s staff communication log and be ready to jump in as soon as her shift started. She stepped up in the absence of the manager and performed numerous duties that really weren’t in her job description, always without being asked. Marie is big fan of teamwork and is great with her co-workers, helping everyone get along together so there’s a strong team helping the ladies in the program. And Marie is always very active in the ladies’ care and excellent at recognizing any behavior or personal changes in them that could indicate a healthcare need. Now that the manager is back, Marie is still the go-to person who’s always ready to pitch in when something needs to be done, still whether she’s asked or not — an Arc Star in every sense of the word. Raphael Salerno, aka Ralph, has worked for our Lumberton Adult Day Services Program as its “Lawn Crew” Leader since June of 2012. When he started, he didn’t have a lot of experience working with people with developmental disabilities, but doing so seemed to come natural to him. He has developed a real relationship with the crew and it’s evident he enjoys the daily give and take. He shows them how to do their jobs by pitching in and doing much of the work himself. Sounds like a good gig: he gets to be outdoors getting paid to exercise in fresh air and sunshine — on most days, that is. On rainy days when the crew can’t do their outdoor work, he’s busy at the center doing indoor things, and the relationship and friendship they’ve all built up over the years really shows. Ralph is also sometimes pulled away to help with the Arc’s Maintenance Department with Jeff when a particularly big job requires more than one person to complete. Whether it’s moving furniture, putting in new cabinets, or plumbing, Ralph never hesitates to help out and according to our Maintenance Supervisor, is a real pleasure to work with. It’s clear that everyone who comes in contact with Ralph really likes him and respects him and a fitting example of what constitutes an Arc Star! It takes a great deal of organization to manage a group home, and one of the biggest responsibilities is insuring that the men and women in our care are receiving to kind of support that allows them as much independence as possible. Shannon’s experience since 2006 when she started with The Arc was evident when she recently undertook a major client move for one of the ladies in her group home whose health now required her to avoid stairs, live on one floor, and remain within the proximity of her day program. After much planning, three logistical situations that needed to come together eventually did so not only with Shannon’s insistence on making the best move possible but also by her including the lady in all steps of the move so there would be no “shock” after the move. All’s well that end’s well, and this move and aftermath showed Shannon’s ability and concern — and why she’s an Arc Star. 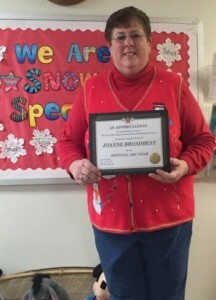 Joanne is a mainstay at our Learn-A-Way children’s program and has been since February 2003 when she began working there as a teacher assistant. Since then she has taken over coordination of the transportation program and because she also has her CDL license, has often filled in for other drivers when needed. Joanne is just of of those really nice people we’re sometimes fortunate to meet. She genuinely enjoys her work and it shows in her consistent smile and offers to help in any way she can. She often volunteers to do extra “above and beyonds” to make sure the children are taken care of and things run smoothly. like taking in buses for service, coming in on her days off to distribute turkeys to families before Thanksgiving, stopping to pick up Target employee Christmas gift donations for the kids to name a few. She’s also on the cleaning crew and helps keep the Learn-A-Way building tidy and spotless. Her supervisor calls her a superior role model,” and it’s easy to see why. 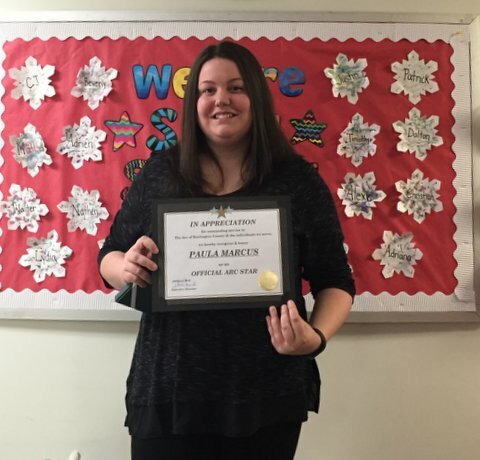 Paula is Learn-A-Way’s Certified Special Ed Teacher and knows how scary it is for the families of our children transitioning into new preschool programs at age three when they need to leave our program. Her goal is to take away that scare, and she always manages to do so. Paula plans and oversees the goals each child works toward and consults with therapists and parents to provide consistency of care to accomplish those goals. Then, when children are ready to “graduate” from Learn-A-Way, Paula provides the guidance and support they need to make a smooth transition. Paula has been with Learn-A-Way since 2012 and we’re hoping she plans of staying a lot longer. Her three “C”s — caring, concern and competence —make her an ideal Arc Star. 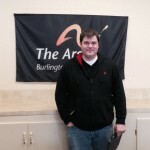 Will began working for The Arc back in January of 2012 as our trainer, but it didn’t take long for people working with him to realize he had a lot more to offer the agency as well. On January 6, 2014, he took over as the residential coordinator for our Grayson Circle and Crestview Group Homes and in June of the same year, added Evergreen Group Home to his itinerary. He is also on the rotating “on-call” schedule for after hour emergencies. Recently, he showed even more initiative than usual and began discussing with Charlene Tinnick, his supervisor, some ideas on how to make staff working hours more efficient. Just about everything that has to do with medications in our various group homes is time-consuming and lends itself to mistakes: refilling prescriptions, counting dosages, administering them on time, etc. Will researched a pre-packaged medication pharmacy and sold the idea to Charlene, after which we implemented it in two of his programs to see how it worked. Staff at both homes agreed the new system was easier and more efficient than the previous meds routines, and Will agreed to help coordinate the Adler’s Pharmacy plan throughout all our residential programs over time. So far it has been a great success saving staff travel time to and from home to pick up medicines, keeping pills sanitary, and eliminating the cumbersome and error-prone counting and recording everyone always had to do. So far, med errors have decreased dramatically. Will agreed to supervise the Courtyards Program during the absence of its manager and made it look easy. (Maybe he shouldn’t keep doing that so we don’t pile more duties on him.) Since the manager’s now back, though, it’s time for us to come up with something else for him! Will never hesitates to discuss ideas on handling staff issues and has just volunteered to teach the Adult Day Program staff how to use one of The Arc’s newer innovations, Therap. In short, Will is a pleasure to work with and is a wonderful asset not only to the residential administrative team but to The Arc as well. There appears to be nothing he isn’t willing to do to help. At least we haven’t found anything so far. As one of our two newest Arc Stars, Yesenia Rivas is a force to be reckoned with! She puts in long hours not so much because she has to but more because she wants to. 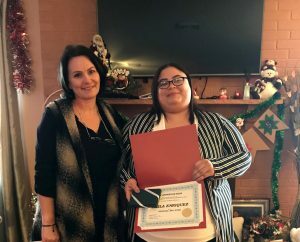 Her part-time status quickly grew to full time, and she now works with a total of seven individuals and families within our Self-Directed and In-Home Supports Program. In addition, she serves as a home health aide for the gentleman she worked with prior to joining The Arc. Yesenia is always ready to jump in when she’s needed and can always be counted on in an emergency. We’ve decided to try to clone her! on it! Wade is the real deal and totally fits our ideal. 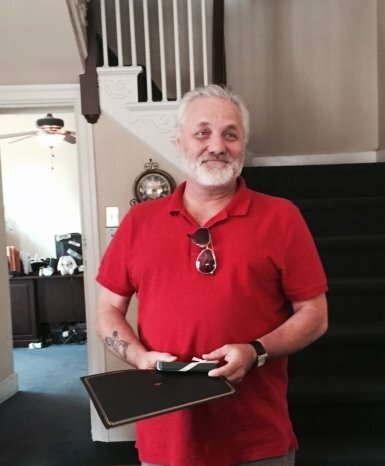 A retired educator from Burlington County Special Services,Wade started working with our In-Home Supports and Self-Directed Supports Programs a year and a half ago. He’s added individuals to his repertoire and jumps into shifts where needed, even when they’re in addition to his own schedule. Wade is willing to do anything to help the individuals he works with lead a more fulfilling life and goes out of his way to make that a reality. As a “ground floor” employee with the In-Home and Self -Directed Supports Program, he has helped the program grow. Fortunately for us, he shows no signs of wanting to leave anytime soon. Good for us and definitely good for the individuals Wade helps every day. 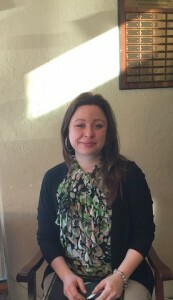 Cynthia Jones is an outstanding Direct Support Professional. 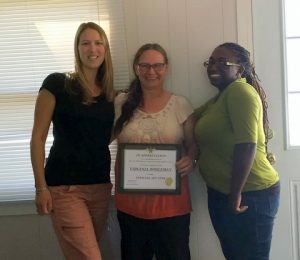 She has worked at the Evergreen Group Home since she started with The Arc in 2003, and while many of our staff go “above and beyond” on occasion, Cynthia makes doing so a regular practice! She always completes her work duties, and her main focus seems to be the joy and comfort of the ladies she works with at Evergreen. Without fail, during a “pinch” when there are call outs, emergency coverage, etc., Cynthia makes herself available to the ladies and other staff and is always willing to fill in the gaps. At times, even when she herself did not feel up to par, no one would ever know because her normal MO is giving 110%! 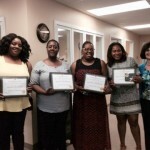 Teamwork is the best word to use to describe the staff of the In Home Supports Program—Danielle Peterson, Nicole Peterson, Jocelyn Muse-Taylor and Melissa Thompson. This staff blends their diverse education and life experiences to provide quality services to all the folks they work with. Thru their varied disciplines (social work, education, criminal justice & sociology), they offer each other techniques and ideas on how to deliver services. They encourage, support and motivate each other as well, and when difficult circumstances arise in their daily work, they are always willing to adjust and adapt their schedule in order to assist each other. They stay focused under pressure and they always get the jobs done! Recently, In Home Supports office moved to a new location from Mt. Holly to Lumberton. These four staff members packed and moved boxes (down two flights of stairs) from the old office to the new. They also took items no longer needed by In Home Supports to thrift stores. In Home Supports staff are dependable, reliable and committed to the mission of The Arc of Burlington County. TEAM = “together everyone achieves more”— and that is what Danielle, Nicole, Jocelyn and Melissa practice daily. Linda Adams has been a team player at Grayson Circle Group Home. 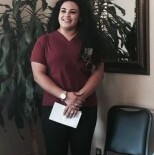 Her positive work attitude has had a good influence on the staff she works with. When she is designated the “charge” person during a shift, things always run smoothly, and she is one of the few staff who communicate regularly with the program manager through Therap online. The dedication Linda displayed recently was remarkable. She took time on her day off to buy pillows, curtains, and tablecloths for the home — out of her own money. She also went a step beyond by sewing matching pillows and has been instrumental in streamlining some medication procedures in the program. 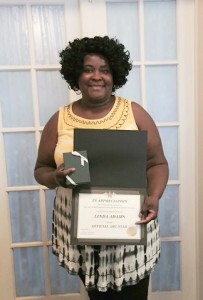 Linda’s dedication and service have been very much appreciated by both staff and residents, and is a real Arc Star! Tammy is a perfect example of an Arc Star. She interacts with just about everyone in the agency through the many varied “hats” she wears, fields phone calls (some not very pleasant! ), works with vendors ranging from IT techies to everyday sales people, solves training issues, billing errors, telephone glitches, and scheduling conflicts, oversees orientation for incoming staff, tackles letter writing, and fixes jammed copiers — you name it. Tammy is everyone’s “go to” person. She does everything with a smile and a consistently cheerful personality and manages to never let herself get rattled by the variety of things she faces each day, many of which would frustrate the rest of us. Not Tammy, though. She’s always willing to help. Tammy is obviously dedicated to The Arc and our mission and, frankly, we’d be lost without her skills and patience. Please don’t plan on going anywhere else anytime soon! 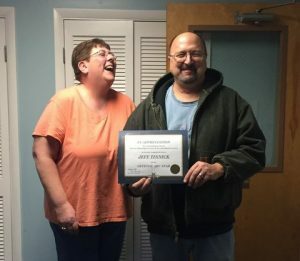 For the past five years, Audie has managed the Lumberton Adult Day Program, and before that was the manager at Eayrestown Group Home and worked at our Marne Highway Group Home. Audie is nothing if she’s not flexible: she can change her schedule on a dime, work in another program when there’s a staff shortage, and always be willing to help out anywhere she’s needed, even when it’s out of her comfort zone! She frequently organizes “pick-up runs” for The Arc Thrift Store when that staff is unable to get donations. She and her staff have moved furniture in various group homes, cleaned basements that were grungy, and helped weed overgrown yards and de-clutter sheds. She’ll track down bids on agency vehicles, and lately this cold winter has taken on making sure various group homes have enough salt for their walkways and driveways during the winter months. When she finds out they’re short, she and her staff deliver it to them. Audie is caring and concerned but doesn’t want anyone to know that — signs of a true Arc Star. Just don’t tell anyone. During the past year, Keith has helped develop the Self-Directed Services and the Support Services Programs, our latest services for individuals and families with intellectual and developmental disabilities. Keith began as a part-time staff and eventually became full-time in order to help grow the program and be available to serve a growing number of individuals and families seeking services. He recently showed some of his ingenuity when he helped several families, whose only sources of heat were wood burning stoves, by obtaining four truckloads of wood to insure they’d stay warm. 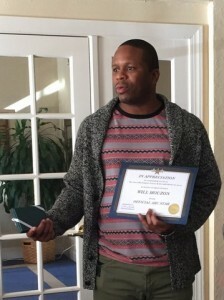 Keith is flexible, hardworking, and has become an excellent mentor to the staff in the Self-Directed Services Program and Supports Program to become productive, contributing and reliable Arc employees.